This article first appeared in The Edge Financial Daily, on November 19, 2018. KUALA LUMPUR: As the stock market continues on a rollercoaster path, some investors are seeking out dividend-paying stocks for stability. But the traditional big-capitalisation income stocks are not necessarily those with the highest dividend yield — the expected annual payout divided by the price. Bloomberg data showed that Protasco Bhd took the top spot in the list of companies with yields in excess of 10% — at 14.08% based on its Nov 9 closing price. Apart from Protasco, Ann Joo Resources Bhd, Texchem Resources Bhd, Malpac Holdings Bhd, Boustead Plantations Bhd, Ivory Properties Group Bhd, and Prestar Resources Bhd are also members of the group of high-yield stocks. However, it is not always the case that high-dividend yields are due to big dividend increases. Rather, the underperformance of the company’s stock over the past few years could be the main driver. And in this fickle market, the fund managers The Edge Financial Daily spoke to still prefer the traditional go-to dividend stocks with strong fundamentals. “Companies with high-dividend yields, we don’t exclude them but we look at them with a more critical eye,” said a fund manager who declined to be named. “That’s because the share price plays a big role in dividend yield. Dividend yield may look good if the company’s stock price has been falling due to some reasons. “When it comes to dividend stock picking, I still prefer companies with a track record of paying out dividends (than high-yielding stocks),” he added. The fund manager cited Matrix Concepts Holdings Bhd, which has a dividend payout policy in place since its listing in 2013. The Seremban-based property developer continues to maintain its dividend payment of up to 40% of its net profit via quarterly dividend distributions to shareholders. According to its Annual Report 2018, the group paid out four quarterly dividends of 3.25 sen, 3.25 sen, 3.50 sen and 3.50 sen per share respectively amounting to RM95.9 million in the financial year ended March 31, 2018 (FY18), 21.2% higher than in FY2017. The payout is equivalent to 45% of the group’s net profit for FY18. The fund manager also likes Matrix Concepts for its focus on the affordable housing segment, where demand remains strong and sustainable. In terms of dividend stocks, he also pointed out that he focuses on the companies’ fundamentals and their prospects. “Let’s take Ann Joo, for example. Bear in mind that the steel industry is volatile, and this has affected Ann Joo’s share price movement as well. Its dividend yield will increase further if the share price continues to fall,” he added. 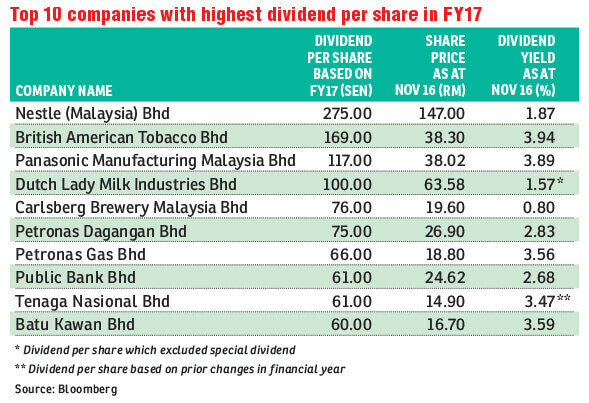 Ann Joo has a 12.75% dividend yield based on the 19 sen dividend per share for the financial year ended Dec 31, 2017 and closing price of RM1.49 as of Nov 9. Year to date (YTD), the steelmaker’s share price has plunged 59.8% to close at RM1.55 last Friday. Malacca Securities head of research Victor Wan said in view of the current challenging environment, he is advising investors to focus on companies that pay good dividends as they are stable in terms of their share price. “Dividend [stocks] should be seriously considered because it hedges against the current weak market conditions. If anything happens to your portfolio, at least you will get cash flow [dividends] and a stable share price,” Wan added. He likes consumer staple stocks, noting that these companies are least likely to be affected by changes in the economy and their dividend payout and yield are likely to hold as well. Wan expects consumer staple stocks will continue to pay dividends going forward provided their financial performance remains stable, citing companies like Nestle (Malaysia) Bhd, Dutch Lady Milk Industries Bhd and Fraser and Neave Holdings Bhd. Wan also expects stocks such as Carlsberg Brewery Malaysia Bhd and Heineken Malaysia Bhd to continue to pay dividends after they received a reprieve from an excise duty hike for the coming year in Budget 2019. Areca Capital Sdn Bhd chief executive officer Danny Wong Teck Meng concurs, expecting consumer staple stocks to give better dividends in the third quarter of 2018, underpinned by strong growth in private consumption following the three-month tax holiday period in June to August. When announcing the third-quarter (3Q) gross domestic growth last Friday, Bank Negara Malaysia (BNM) revealed that private consumption growth accelerated to 9% from 8% in 2Q 2018. Household spending was boosted in July and August, following the zerorisation of the goods and services tax rate, particularly on durable goods such as motor vehicles and furnishings, as well as food and beverages. BNM also commented that continued expansion in income and employment provided key support to household spending. Wong said dividend stocks that are fundamentally intact remain attractive in the current weak market conditions. He names Malayan Banking Bhd (Maybank), the country’s largest lender by assets, as his top pick for its strong fundamentals and attractive dividend yield. 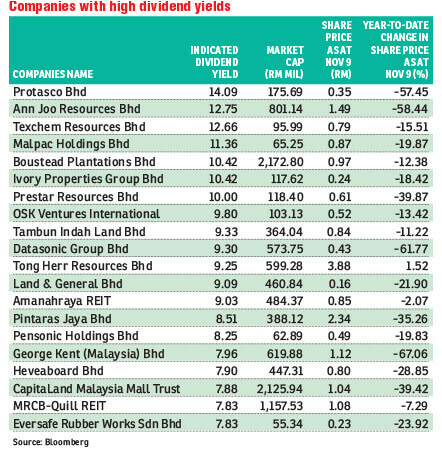 Maybank had a 6.2% dividend yield as at Nov 9. YTD, its share price has dropped 2.17% to close at RM9.45 on Friday. In contrast, Wong is staying away from telecommunication stocks for now due to the challenging operating landscape given intense competition and heavy capital expenditure required for network expansion. He said this has resulted in fundamental changes and negatively impacted their cash flow, thus telcos may not afford to continue to pay good dividends to shareholders in the near future. This also applies to gaming stocks, in particular Genting Malaysia Bhd which is seen as the largest loser under Budget 2019 due to the increased tax duties imposed by the government. “While Genting Malaysia may still have the cash to pay dividends to shareholders, but due to the increase in gaming tax, casino duties and casino licensing fees, it will have to pay more taxes in the future [which will likely impact their cash flow],” said Wong. Genting Malaysia’s dividend yield stood at 3.06% as at Nov 9. YTD, its share price was down 37.2% to close at RM3.63 last Friday. Wong noted that numbers forecast operators — Berjaya Sports Toto Bhd and Magnum Bhd, are still attractive as dividend plays as these companies are not affected under the new gaming tax. Inter-Pacific Securities Sdn Bhd head of research Pong Teng Siew said even large-cap companies may find it difficult to maintain their dividend payouts during the challenging time. “Looking at the company’s historical records is not a sure-fire way of picking winners. Companies who did worse than before will cut their dividends as well,” he added. Going into the 3Q earnings season, Pong foresees consumer stocks will continue to pay good dividends, but he does not expect these companies to change their dividend policy for a short-term boost. “Paying dividends involve cash. It [having insufficient cash in hand) will cap the company’s ability to cushion during adverse conditions. As such, in many cases, many companies are reluctant to pay very good dividends unless the business condition has improved permanently,” he added. So far this year, the FBM KLCI has lost 90.43 points or 5.03% to close at 1,706.38 points last Friday.